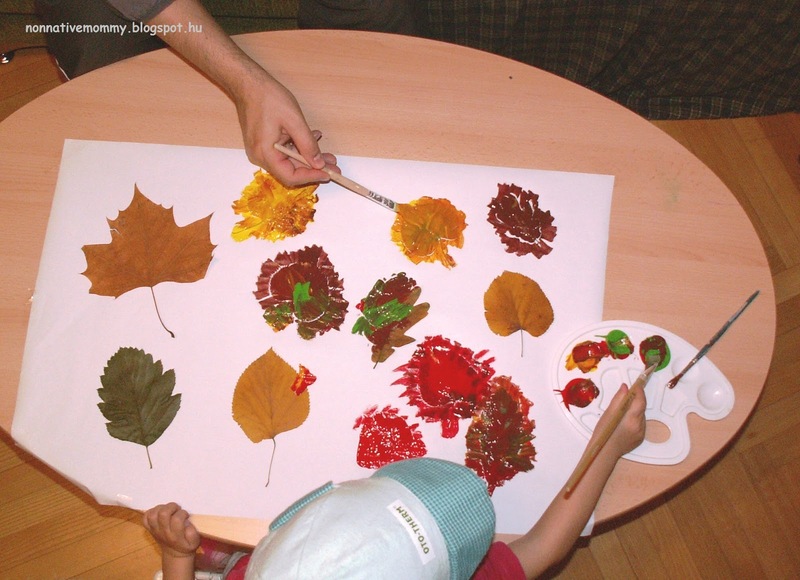 After playing outside and observing the autumn leaves I prepared an easy, colourful painting activity for E.
While doing it with our Canadian nanny, V., we were revising the autumn colours and talked about why leaves change colours in the autumn. 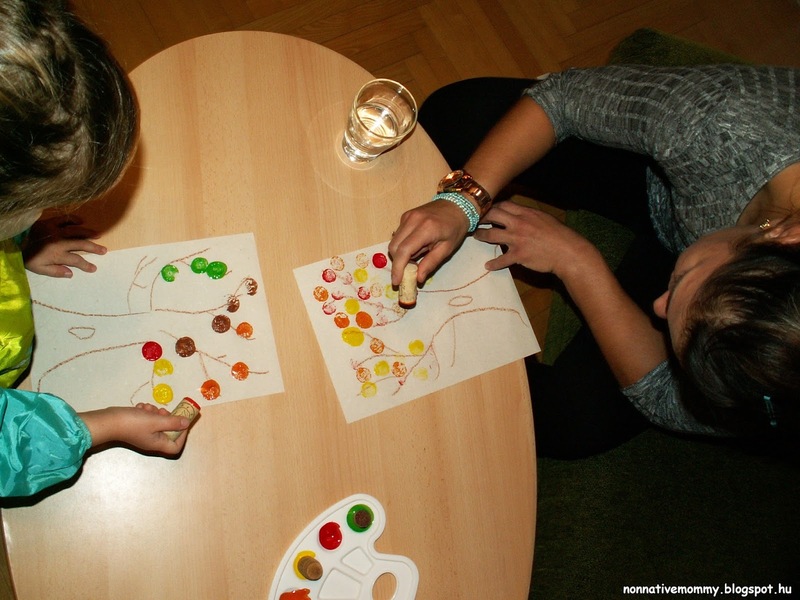 So after snack time when our nanny, V. arrived they sat down together to start painting. The painting could start. 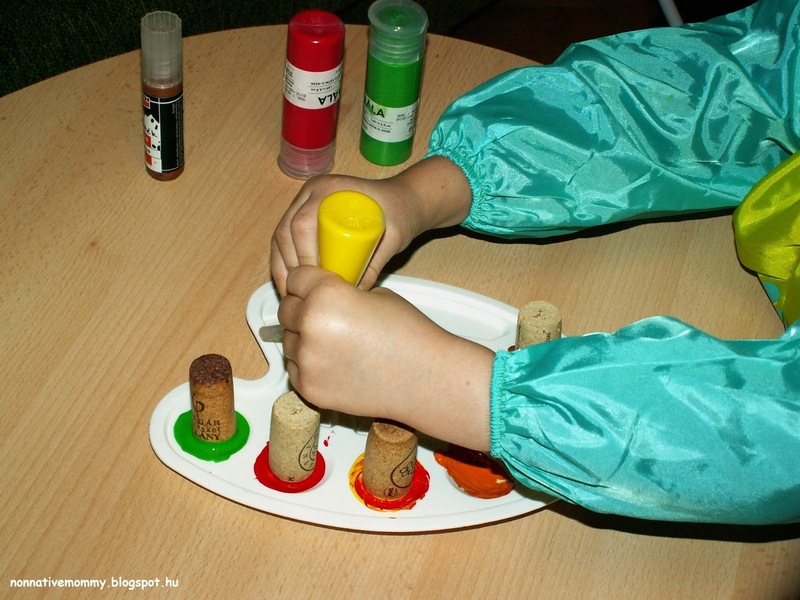 E. squirted the paints on the palette, which is a great activity to strengthen the muscles in her hands). 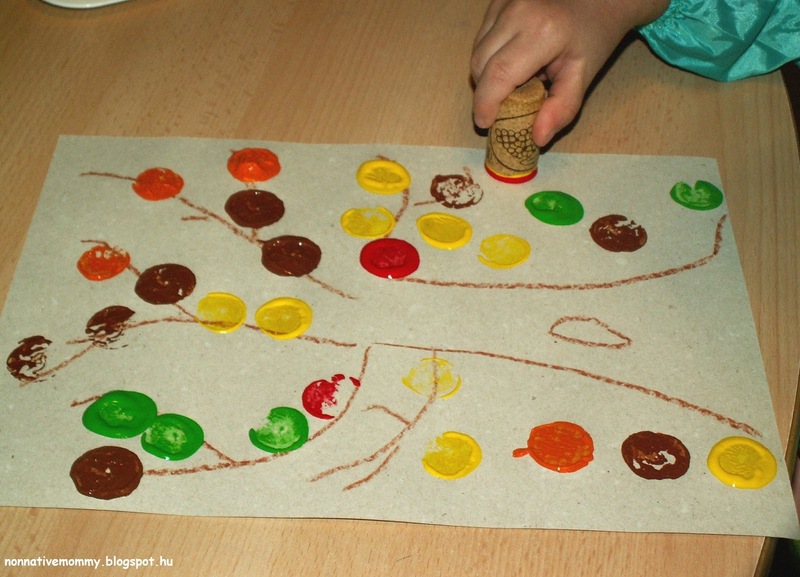 Each colour had its own cork. They made dots on the branches. Autumn leaves are falling down. 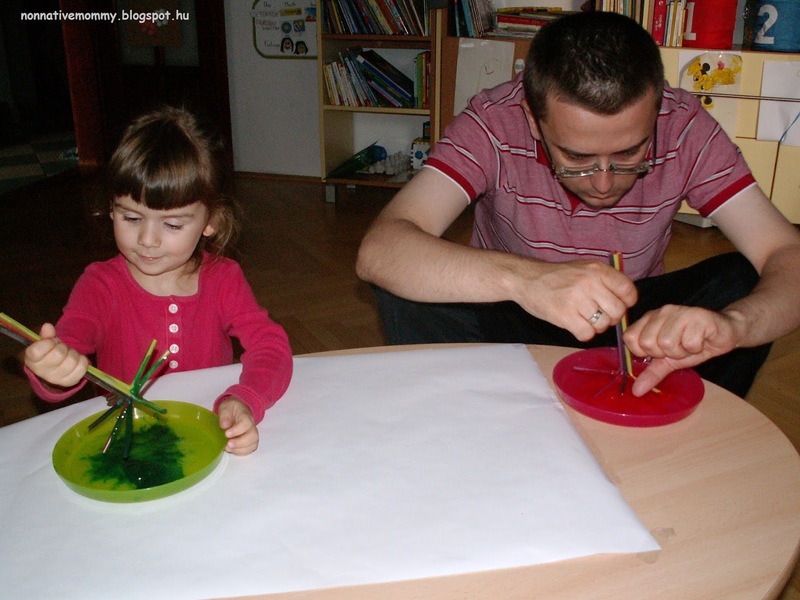 I hope I will have more time to write about some baby activities we’ve been doing, just like this one – smudging paint in a plastic bag. 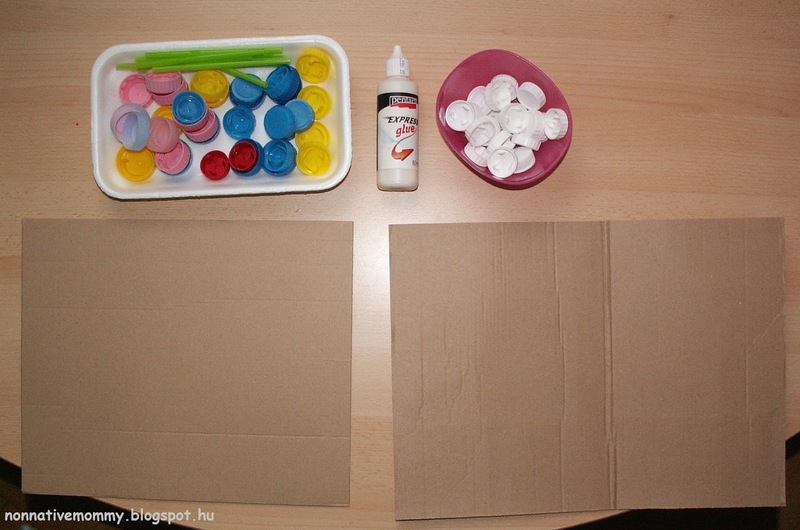 An easy to prepare activity for a baby. What you need is in the picture. 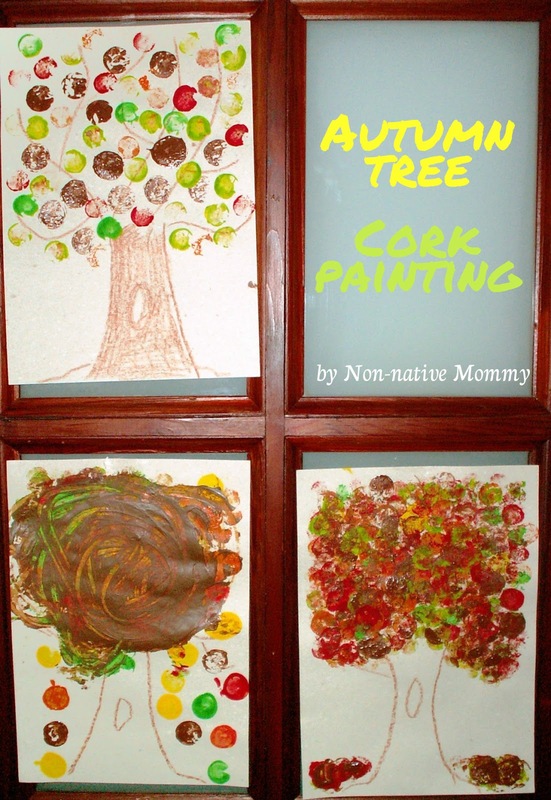 I used baby paint but any kind will do as the baby won’t touch the paint directly. 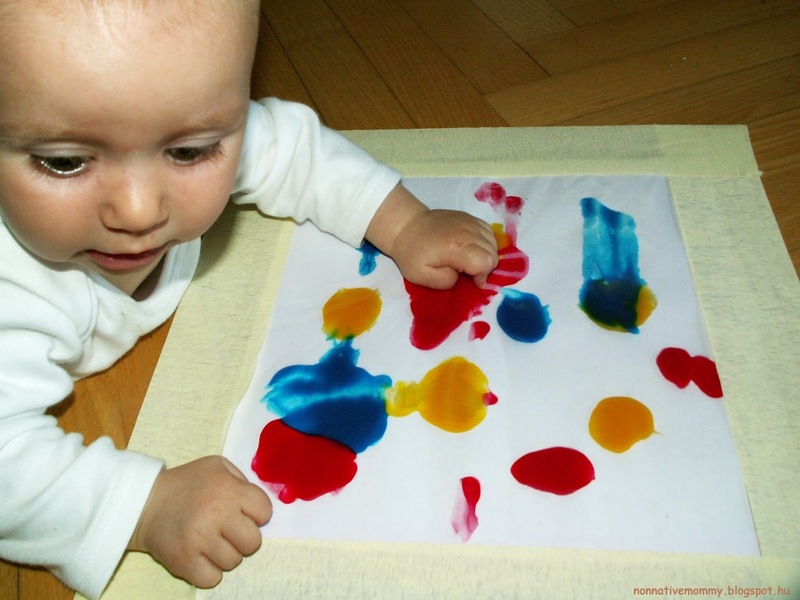 I put dabs of paint on a white sheet of paper of 3 colours. Unfortunately, I used too much paint. In this case less is more. 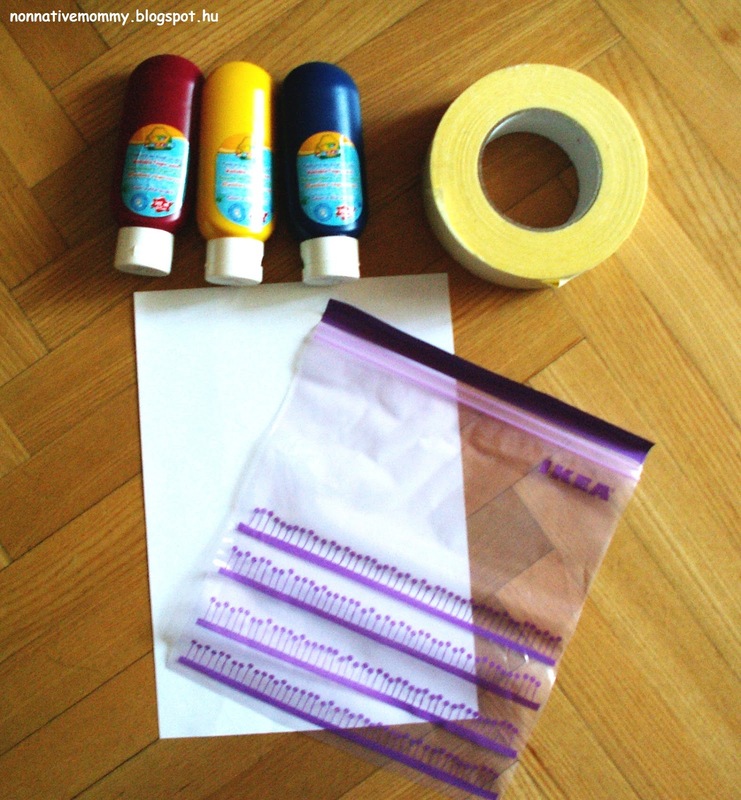 Next, I placed the white sheet with paint into the zip lock bag. 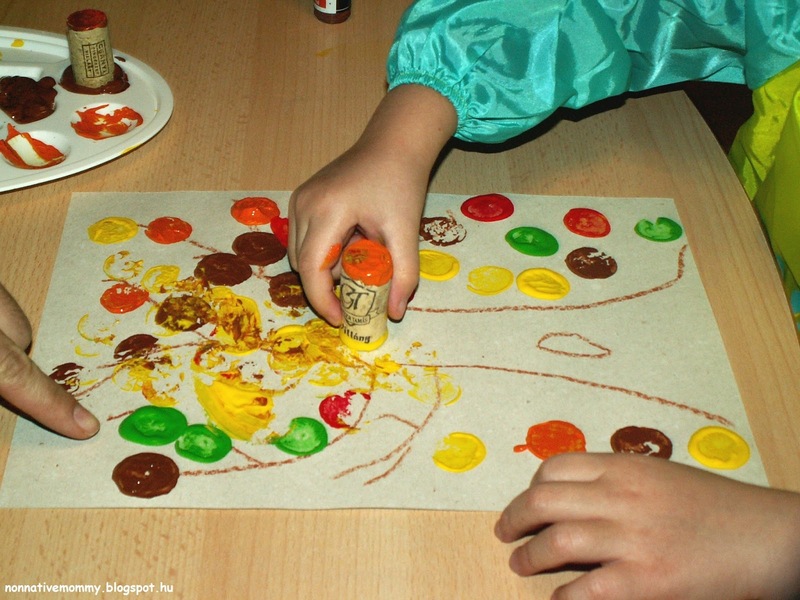 You need to be extra careful not to smudge the paint while sliding it in the bag. With painters’ tape I fixed it on the floor and put L. close to it. In seconds she scooted there to check what it is. 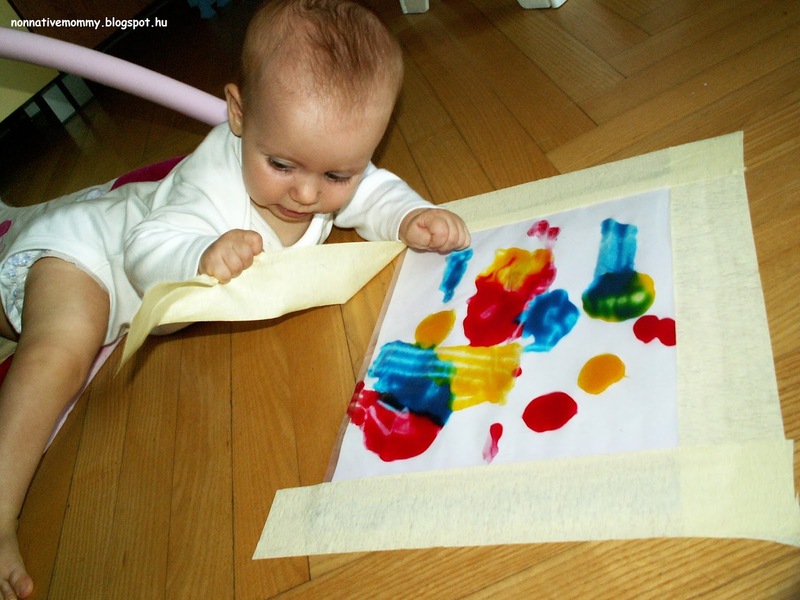 To be perfectly honest, she was a bit more interested in the tape than the paint blobs against the white background. Kids are unpredictable. 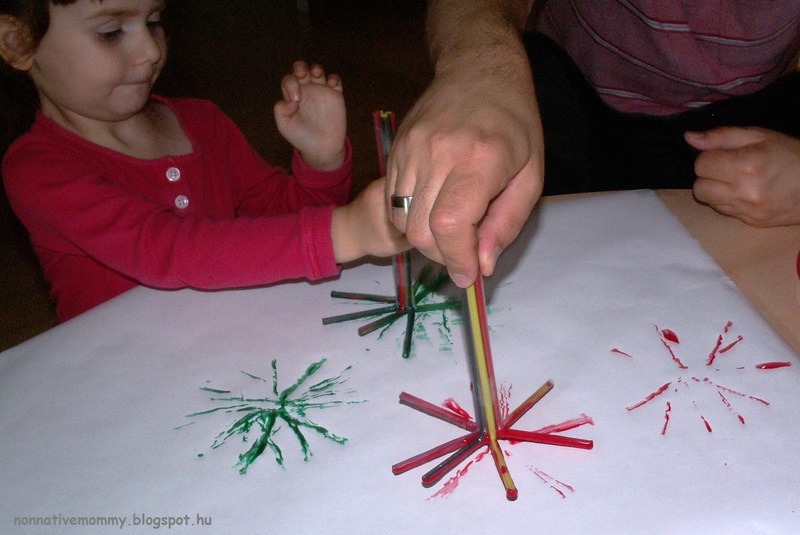 While she was messing around I was talking to her about the colours: red, yellow and blue. 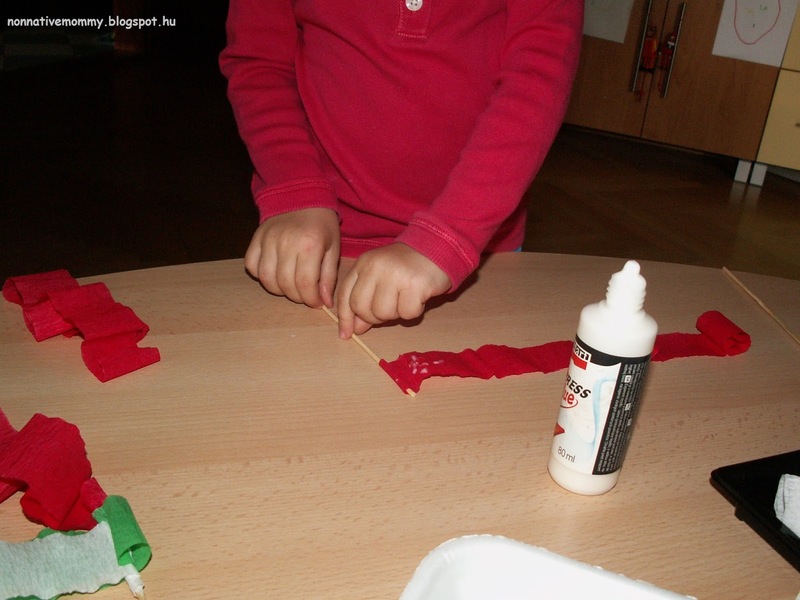 When E. came home from the kindergarten and she saw what we did. She enjoyed looking at the colour mixture. 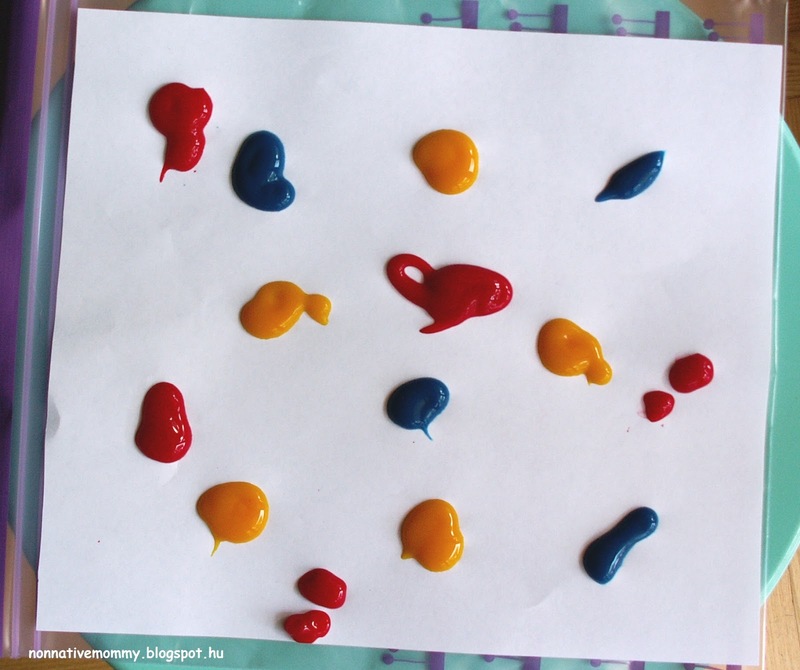 We talked about what happens when we mix colours: blue and yellow makes green; red and blue makes purple, red and yellow makes orange. So it’s a two in one activity if you also have a bigger child. 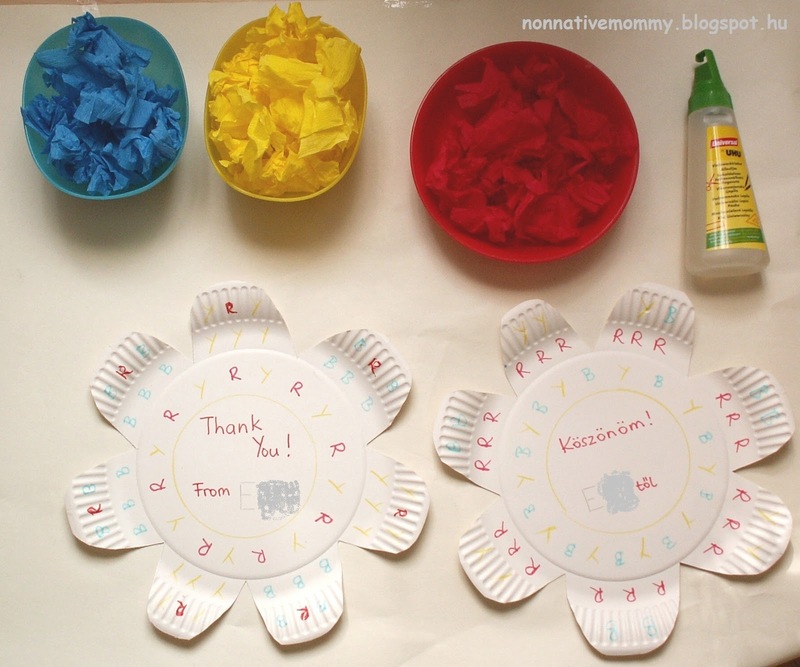 We might do this activity again a little later too. 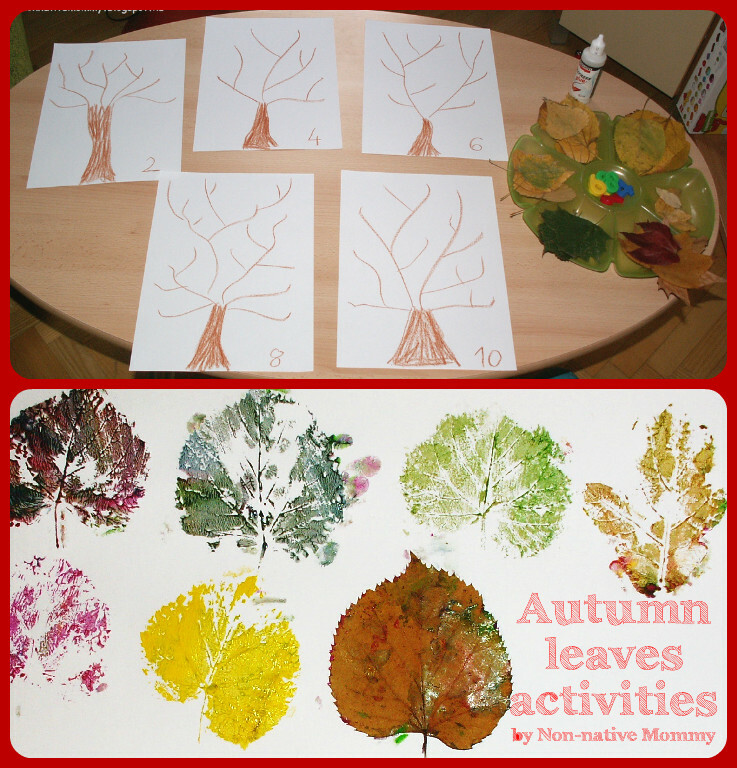 As autumn has arrived we started to collect leaves every time we went somewhere. 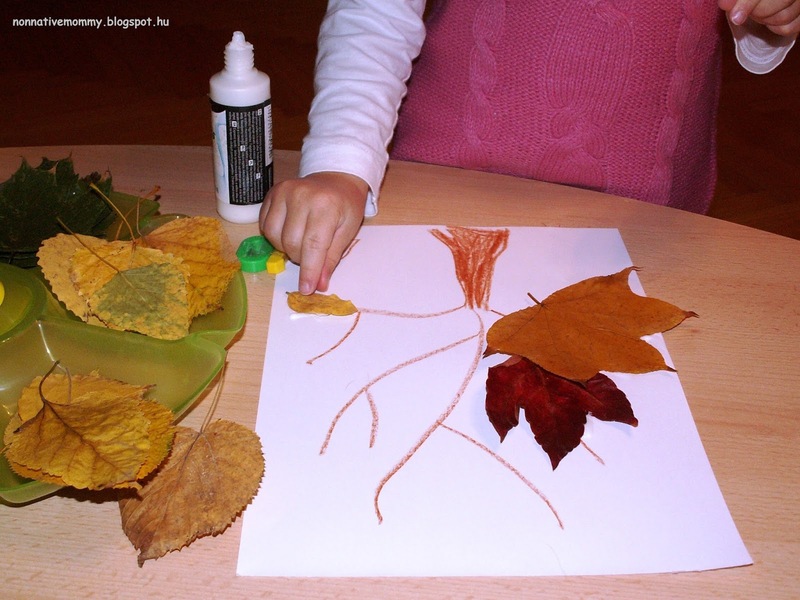 We were talking about the gorgeous colours of autumn leaves like orange, yellow, brown or red. 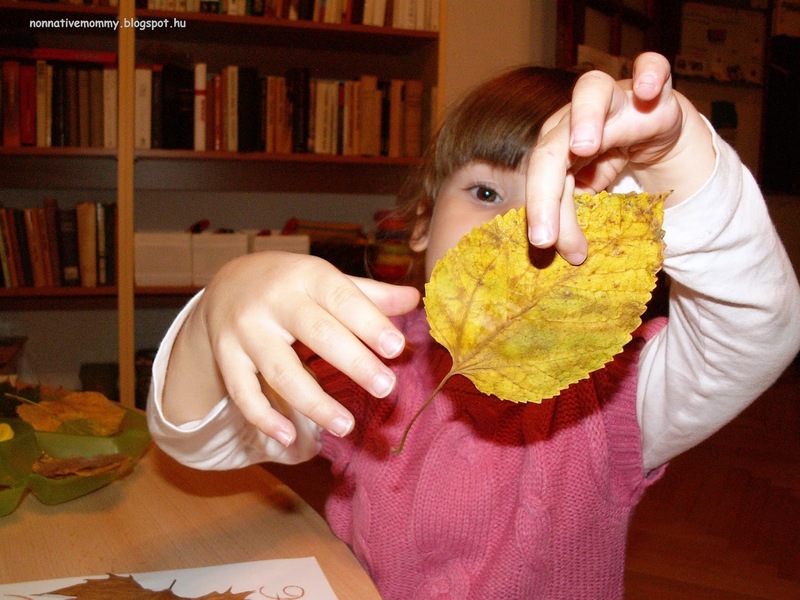 We also observe the different shapes like circular, heart-shaped, hand-shaped as well as their edges (smooth, wavy, toothed). I checked this image from the net to make sure I do not say anything silly. Then we had painting fun. 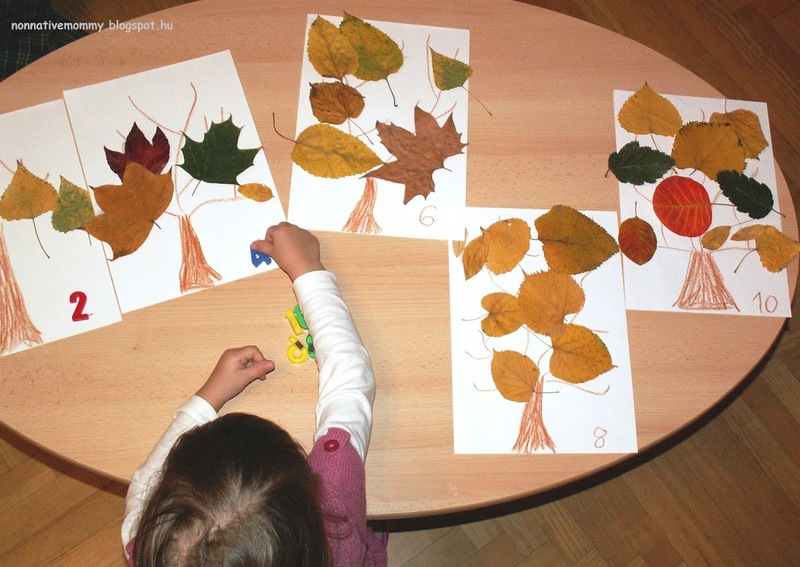 E. chose the colours (I tried to direct her to the autumn colours with little success) and we painted the backside of the leaves and made prints. 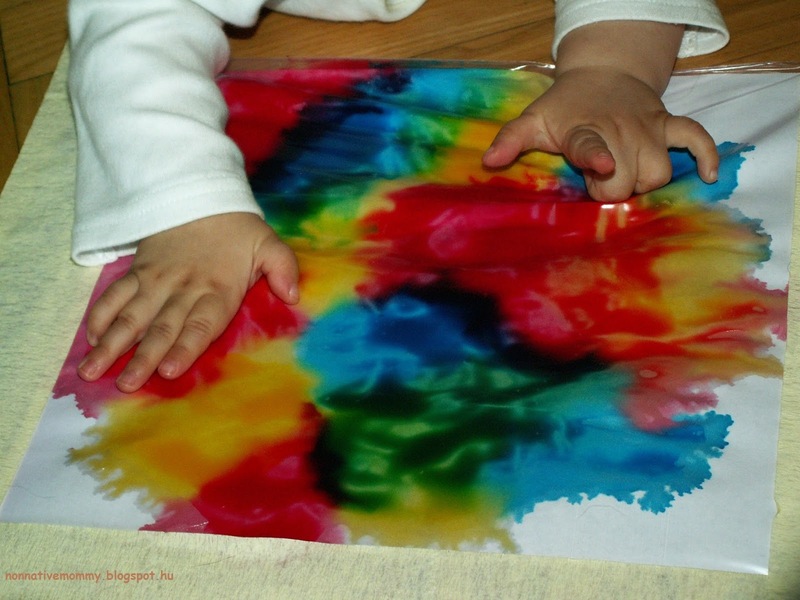 At first, we used too much paint, but then we could observe the beautiful prints the veins and the edges gave out. 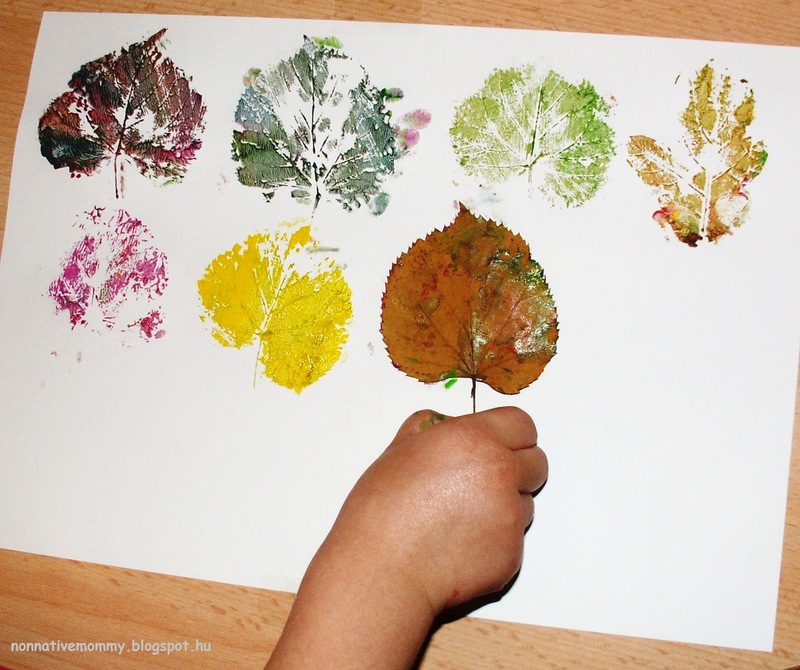 I pressed some leaves and stuck them on a white sheet of paper with the help of small pieces of Cello-tape. 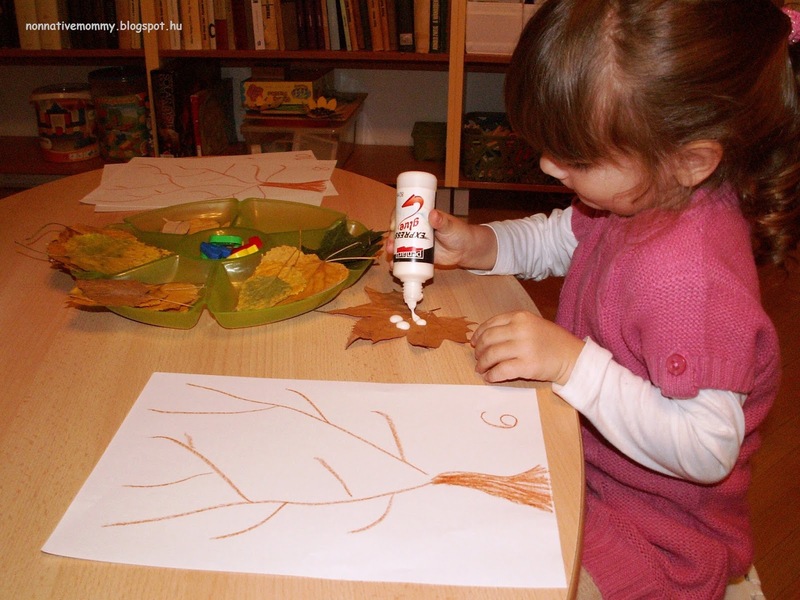 Then we painted the leaves over creating an outline. 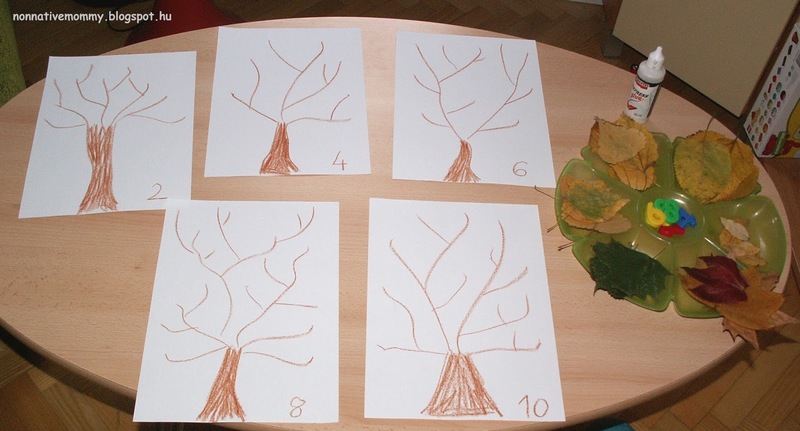 This was a hit with E.
I drew these bare trees for E. It can serve as a simple counting activity. 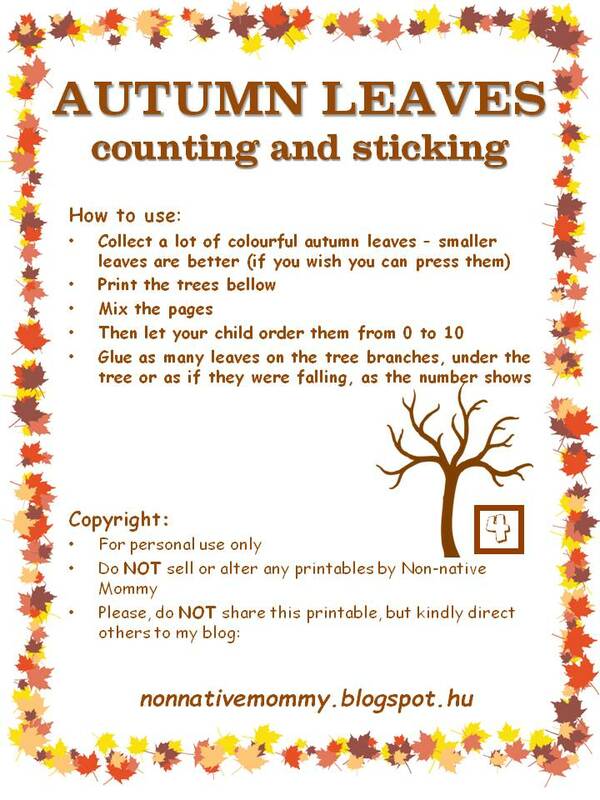 Your child needs to stick as many leaves on the tree as the number shows. 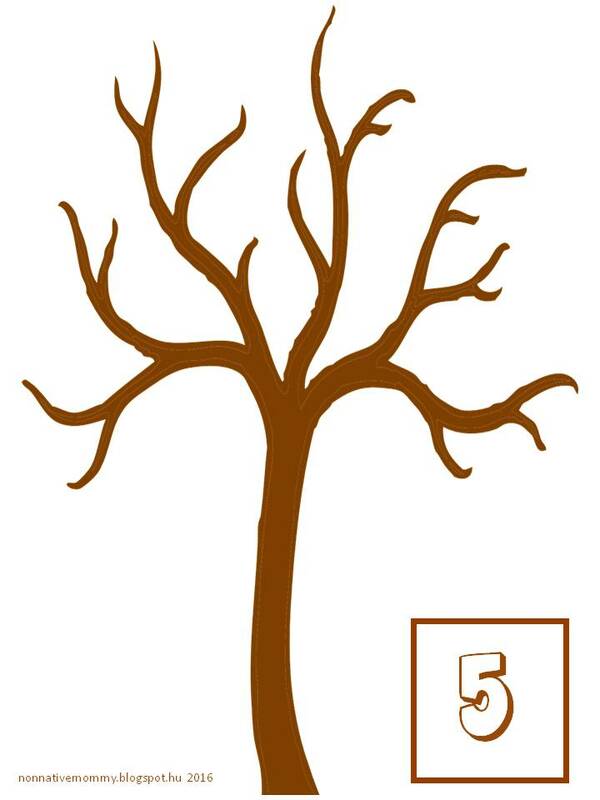 I’ve prepared printable trees you can download at the end of this post. As simple counting is not a challenge for E. any more I thought skip counting would raise her interest much more. And I was right. 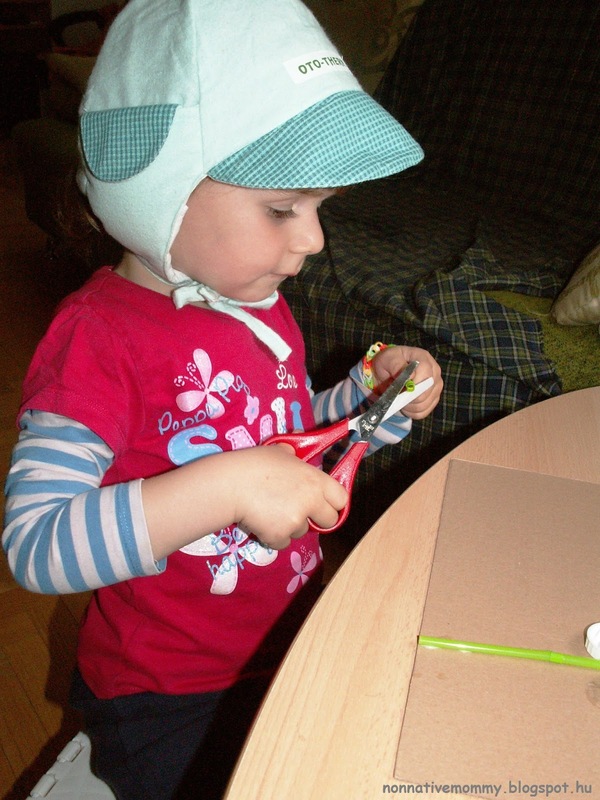 Although it was a little too long an activity, she managed to finish it after my encouragement and help with the gluing. 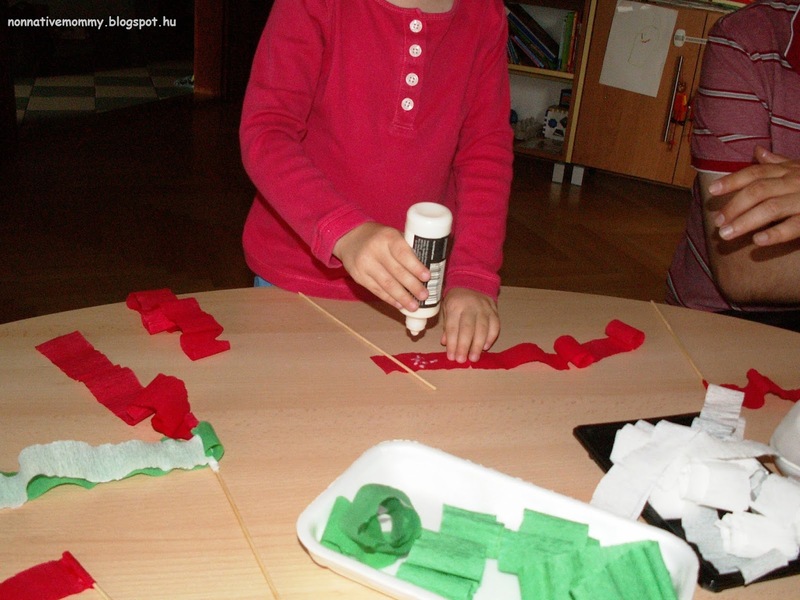 Placing the magnetic numbers – finished! 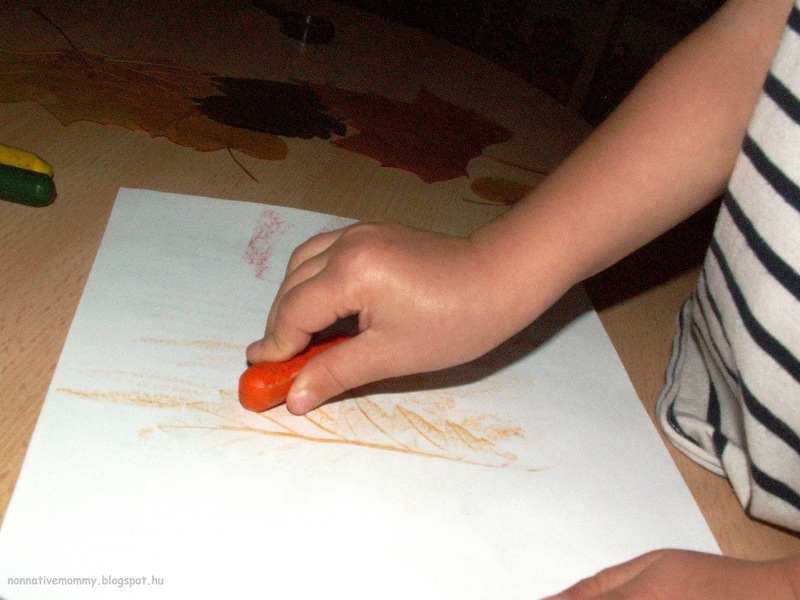 Hold your paper down with one hand and rub with the other hand. 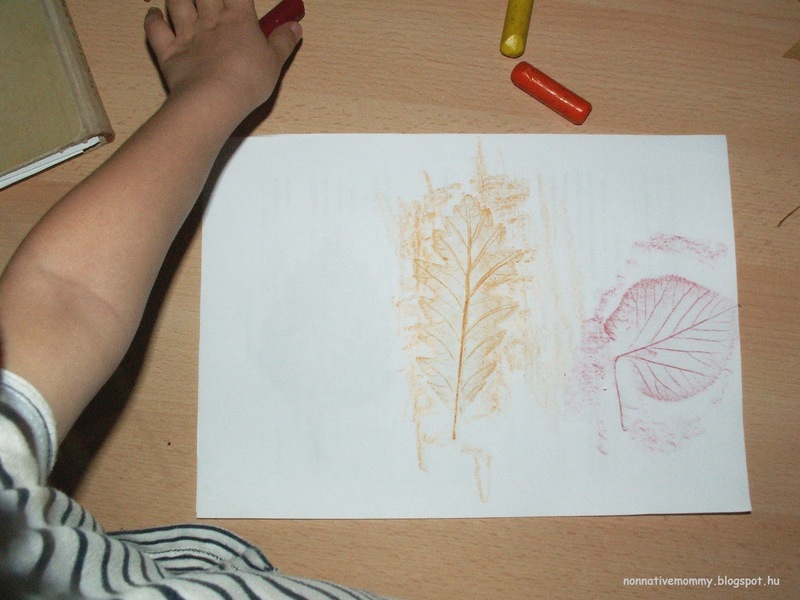 Paint the backside of the leaf, like this. 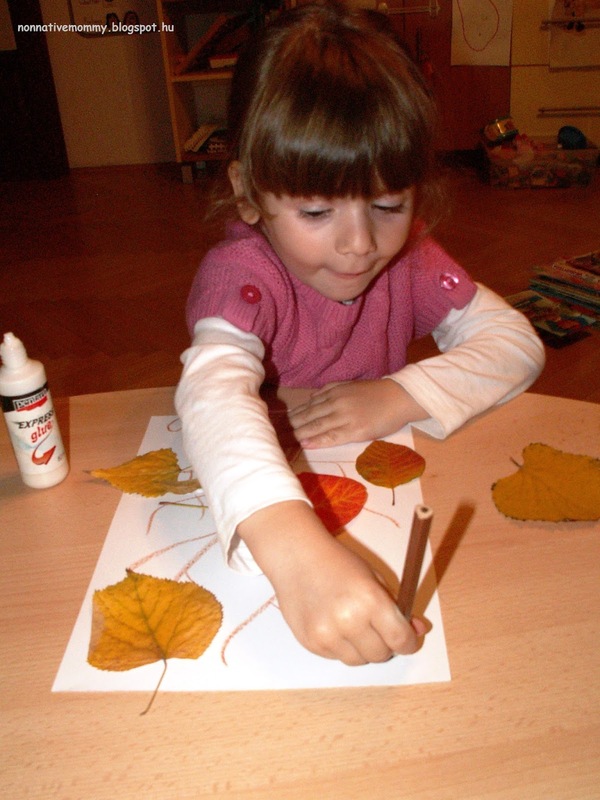 You can add more glue this time because this leaf is big. Finally, we displayed everything on our living room doors. E. shows her pieces of artwork to whoever comes to us. As we have just returned from our holiday from the mountains, I haven’t had time to prepare something special for today. 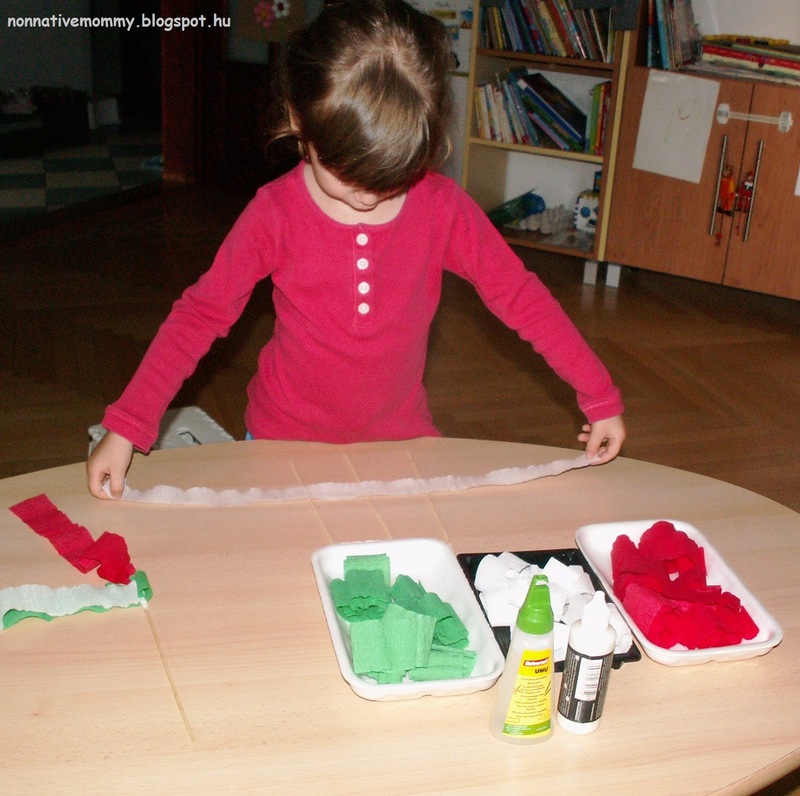 20 August is the 2nd biggest national holiday in Hungary. (I’ve already collected some activities for the first most important one i.e. 15th March). We also call 20 August Saint Stephen’s Day or the commemoration of the Foundation of Hungary as a state or “the day of the new bread”. If you’re interested in the background of this Hungarian holiday, please check the links. 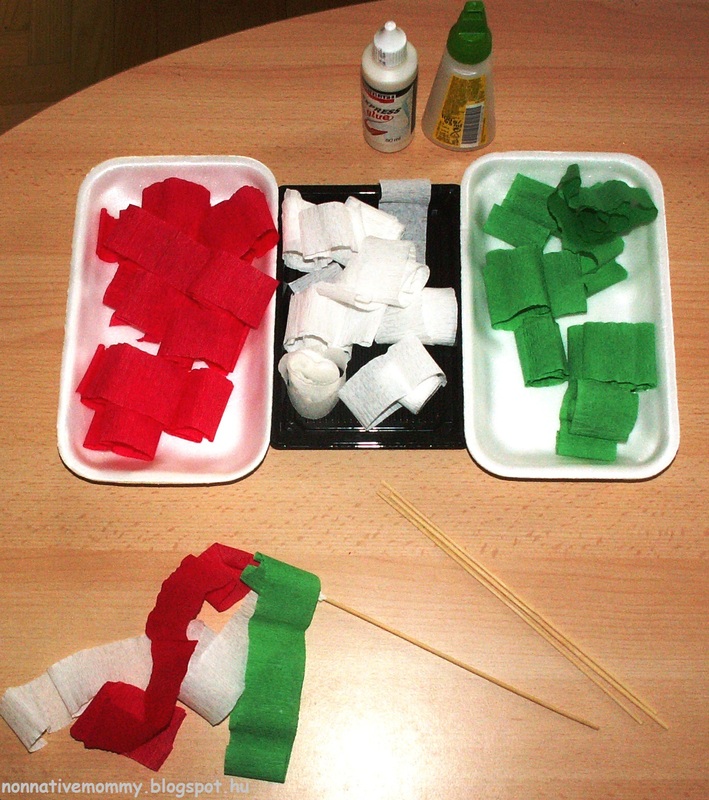 So quickly I put together some fun crafts connected to our modest celebration after having unpacked our suitcases and started the washing machine. On the way home sitting in the car, E. could see the Hungarian flag everywhere. 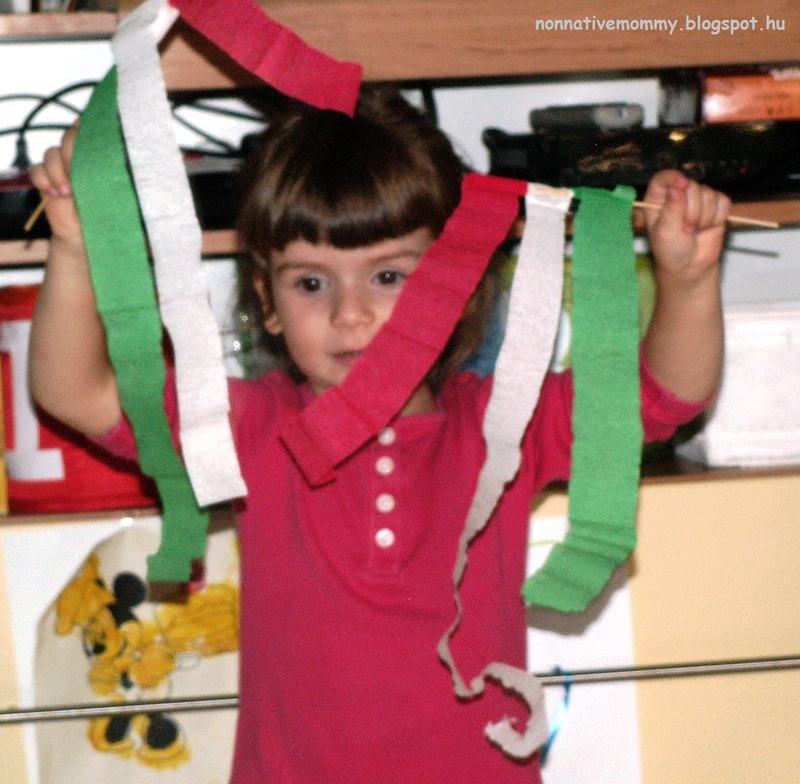 She got quite excited and pointed at all of them shouting: Hungary… so we made this flag out of crepe paper (red, white and green) and a piece of wooden skewer. You need some glue and that’s all. The easier the craft is the more fun you’ll have afterwards. 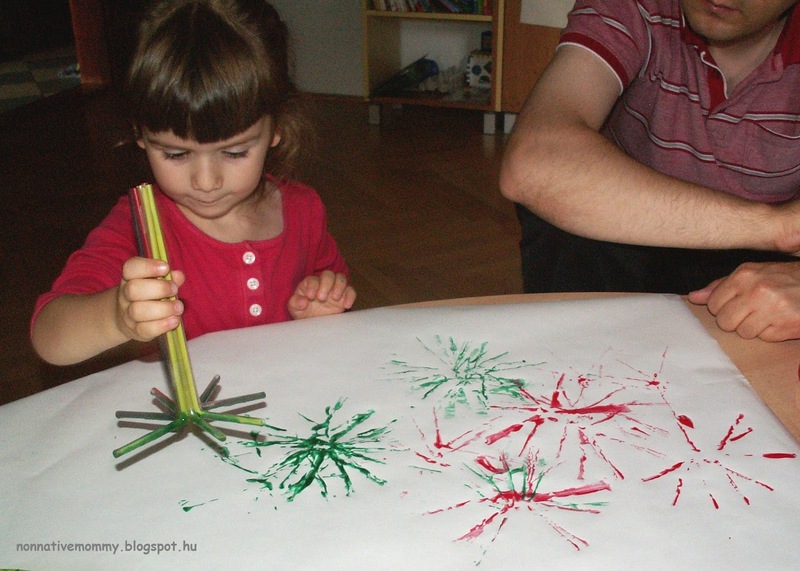 As we celebrate 20 August with massive fireworks over the River Danube at night, I thought we could create our own fireworks at home. We are not going to watch it in person as it is always extremely crowded and the weather has rather been capricious lately. I’ve taken some ideas from 4th July celebrations. Check out the pinterest board on the topic. 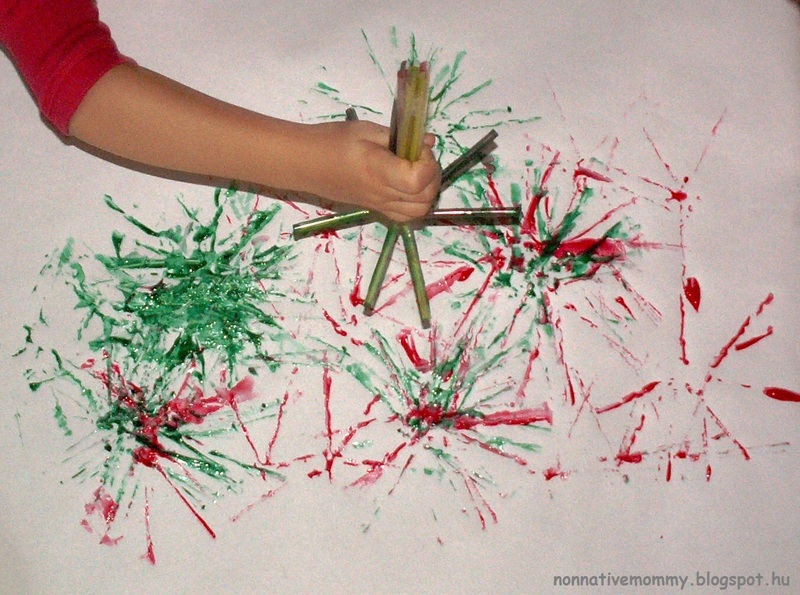 This exact fireworks straw paint is more than fun to make. 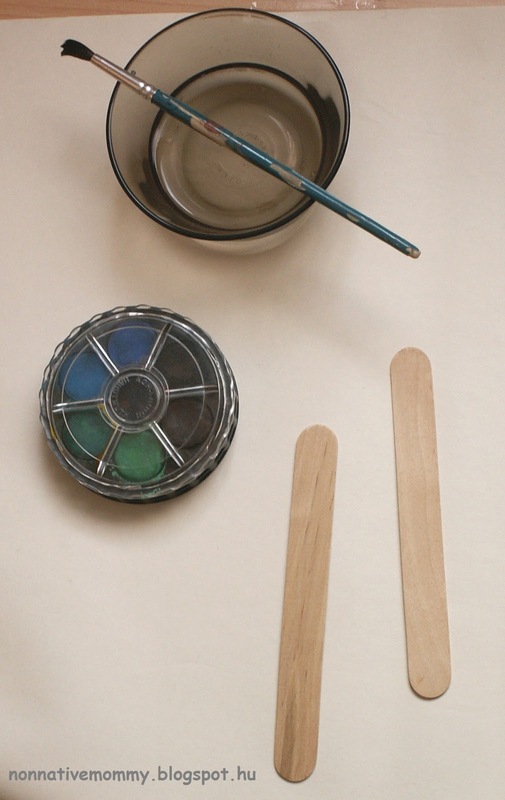 The painting can start. 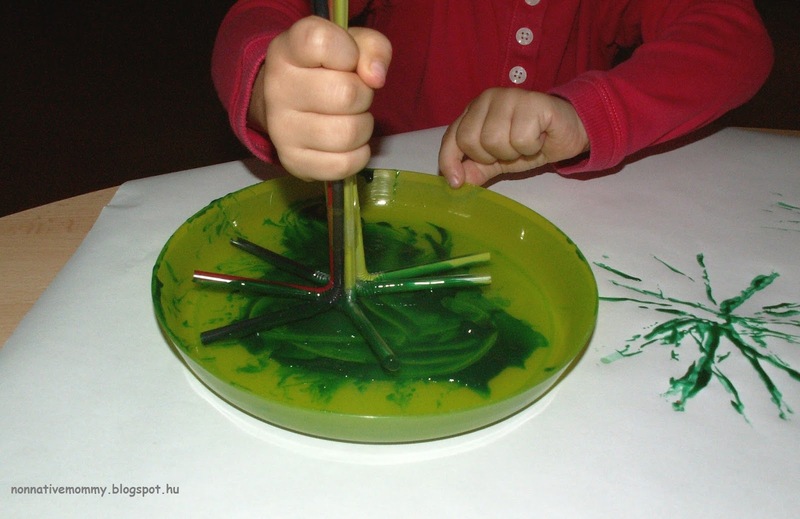 Your child needs to dip the straws into the paint and make prints with both colours. 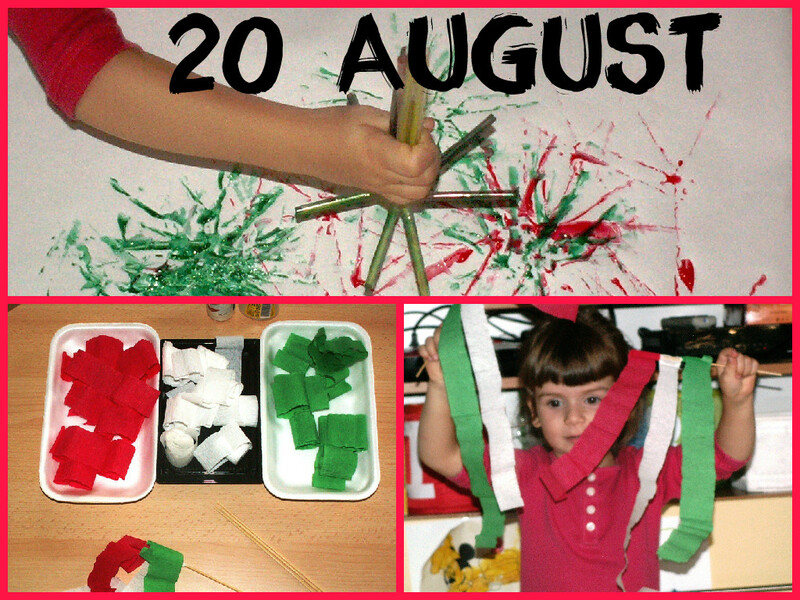 Did you celebrate 20 August somehow? 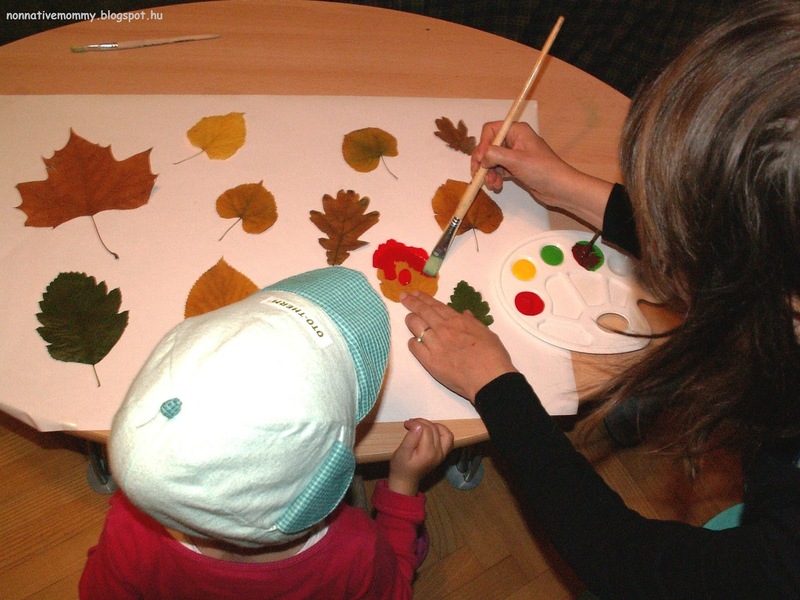 Let me know what you did together with your little one in the comments. This post should have appeared in May the latest when we finished our flower projects. Well, there are tons of flowers around us during the summer time so it’s never too late to have a closer look at them. 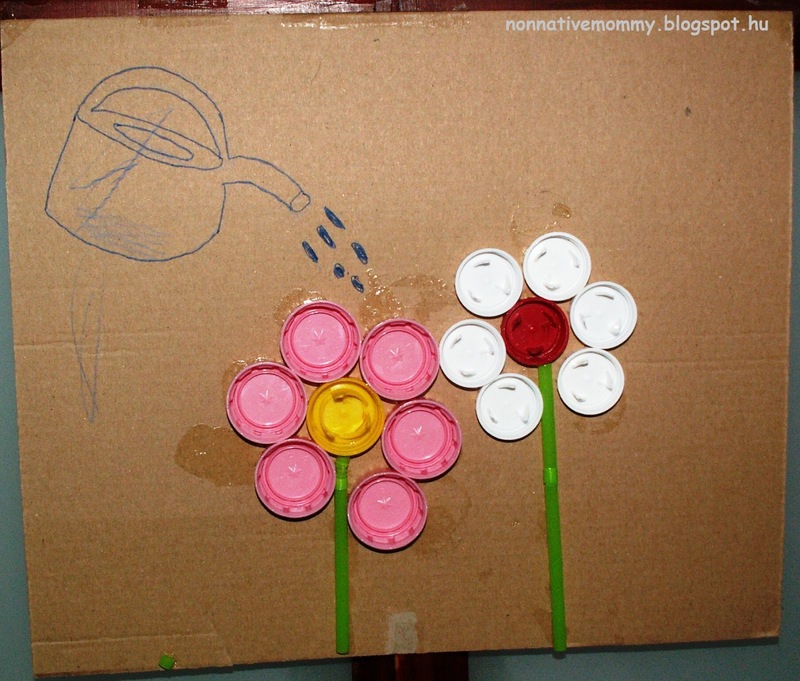 Show and explain your child the different (basic) parts of a flower. 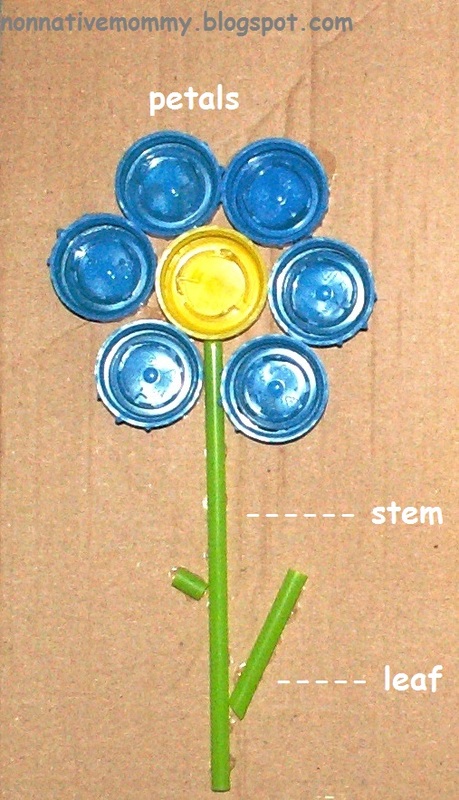 E. had already known these parts so she named them as I put together a flower. 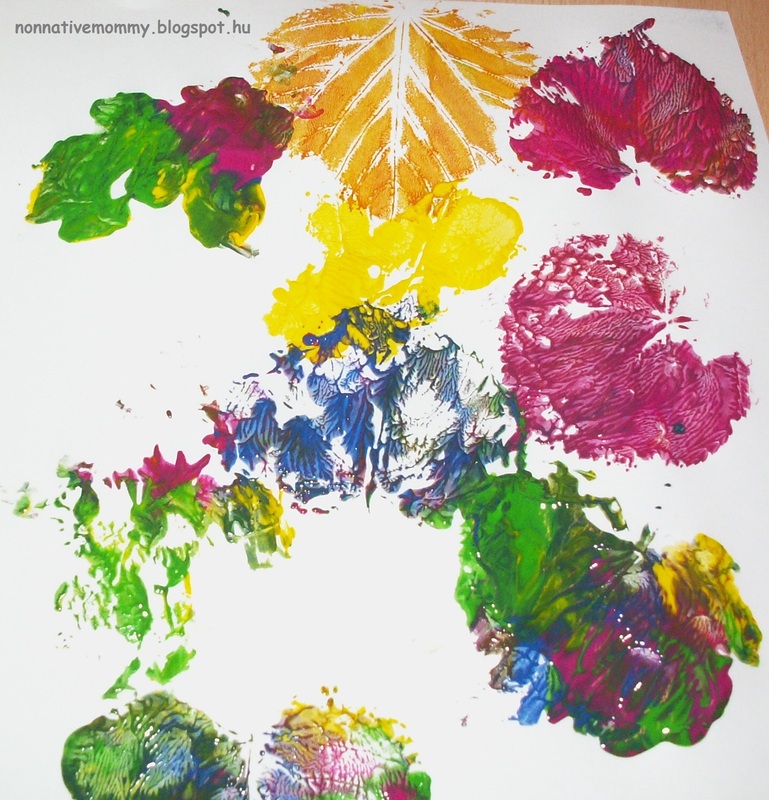 Then we both started to work on our flowers. 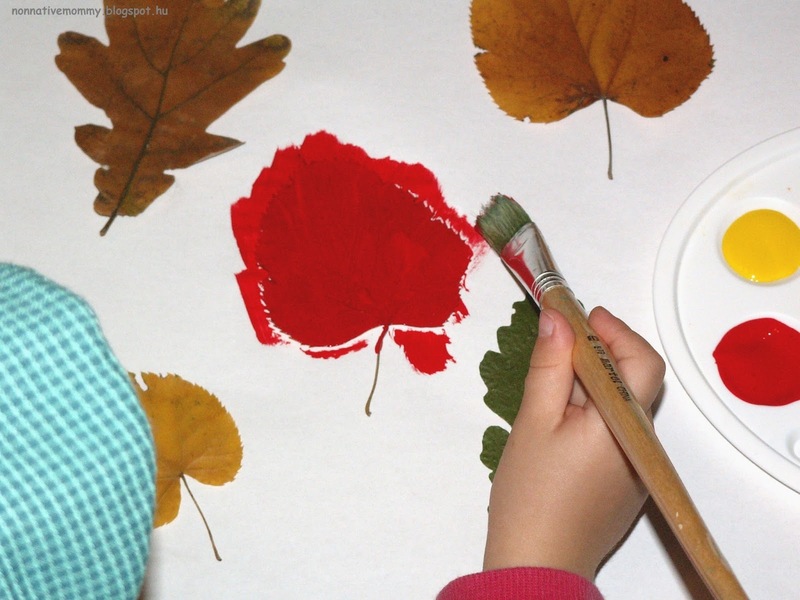 We were talking about what colour petals we chose or if our stem was long or short, if the flower had leaves or not. E. used the scissors herself to cut the stems. 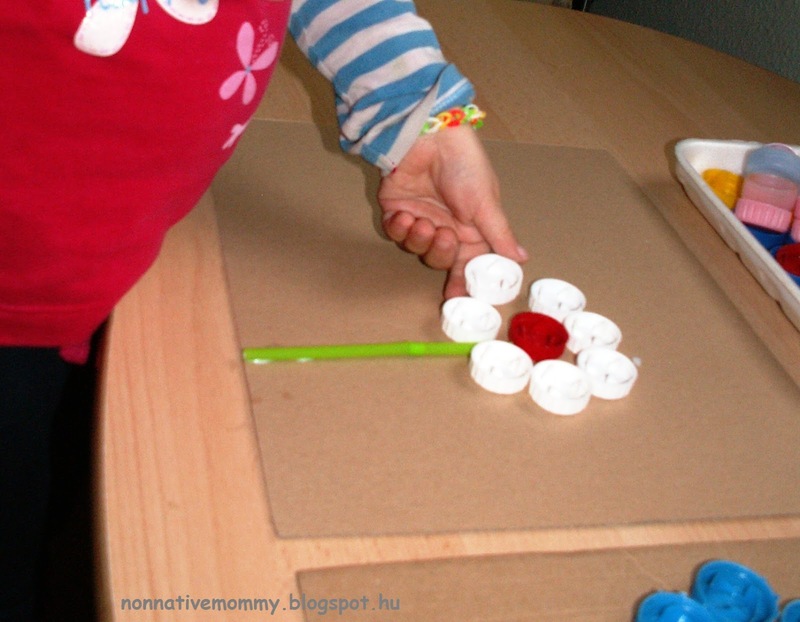 This is just the first step on parts of a flower. We’ll expand the topic later on. I’m planning to prepare some flashcards and worksheets on more detailed explanation on flower parts. 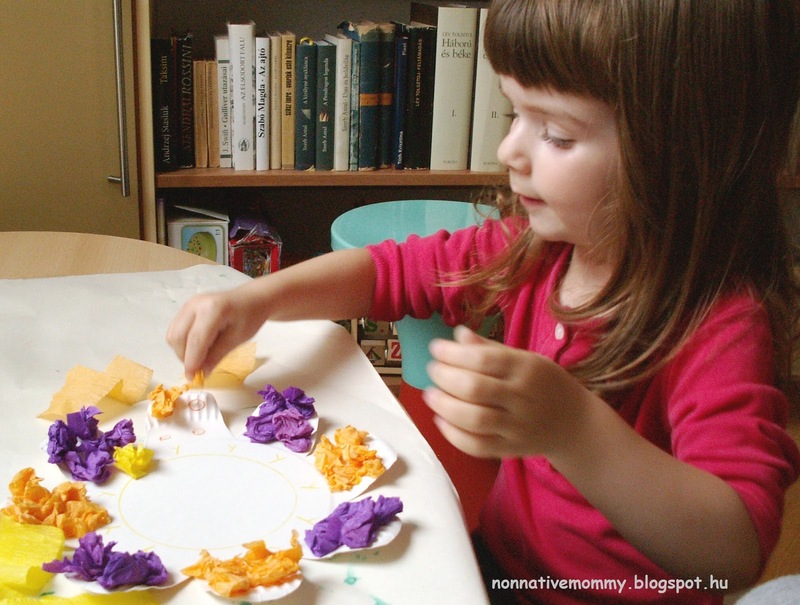 Cut out flower petal shapes of the plates. First, I drew the lines on the paper plate then I started cutting. 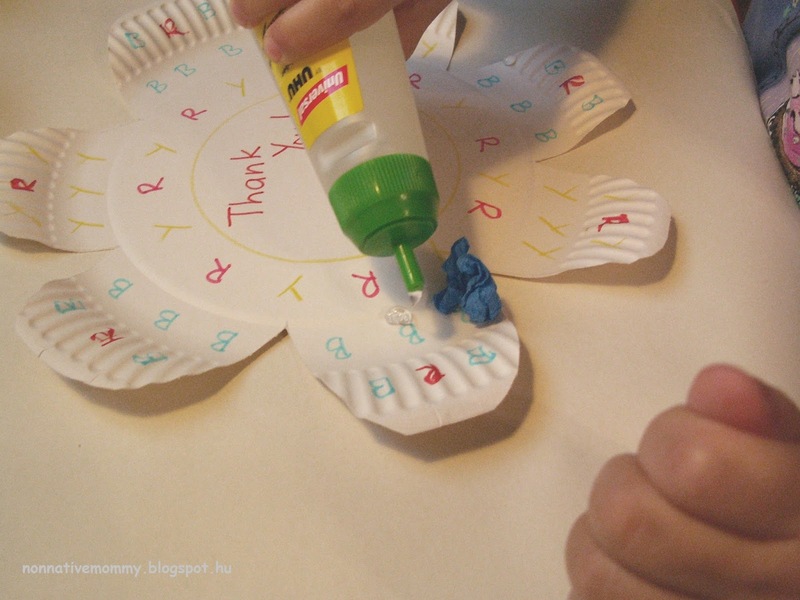 As I know E. has no patience to do long tasks I decided to direct her attention on coloured letters written on the paper plate. 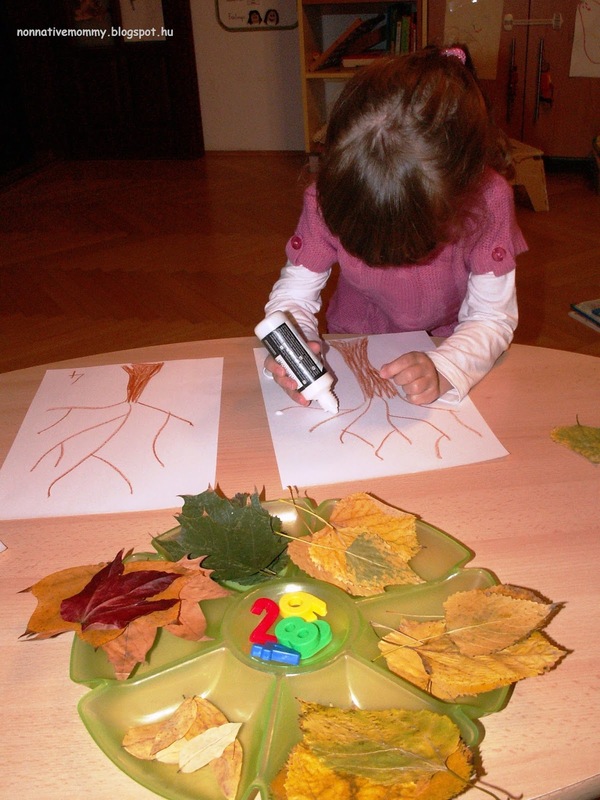 The letters showed her where to stick which colour. Her focus was much better in this way. I also wrote Thank you! in the middle and letters of her name she could trace. 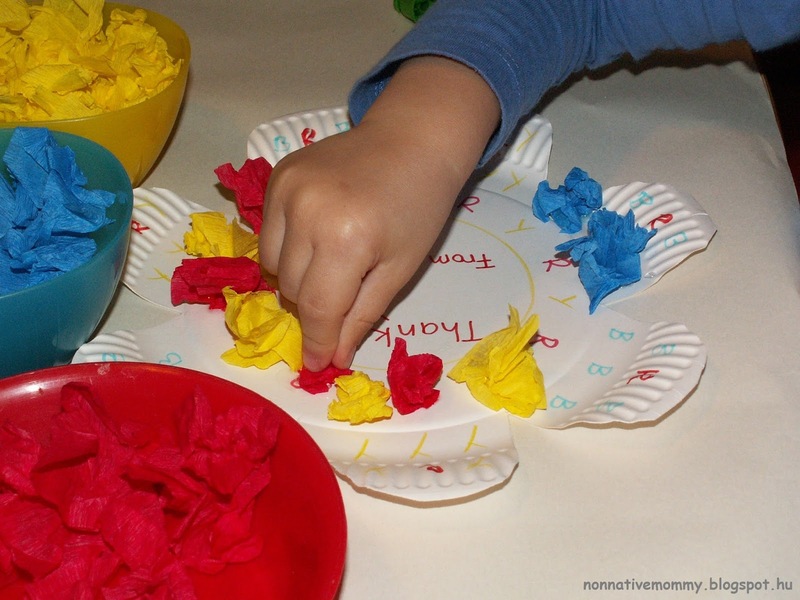 I cut up the colourful crepe paper into small pieces beforehand. 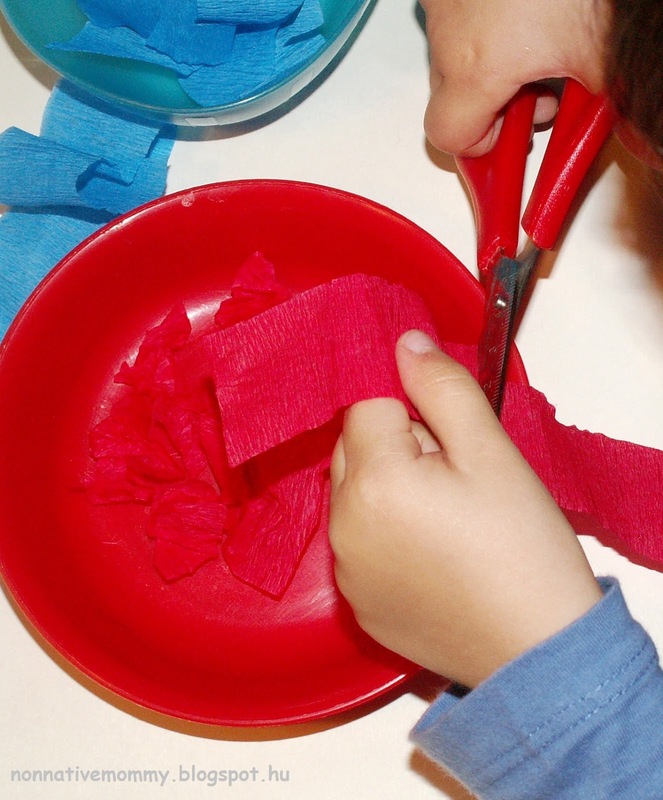 We ran out of them on the way so she wanted to cut more crepe paper herself. This was a great way to relax a little bit as there’s lengthy gluing involved. A goodbye flower for Ms B. 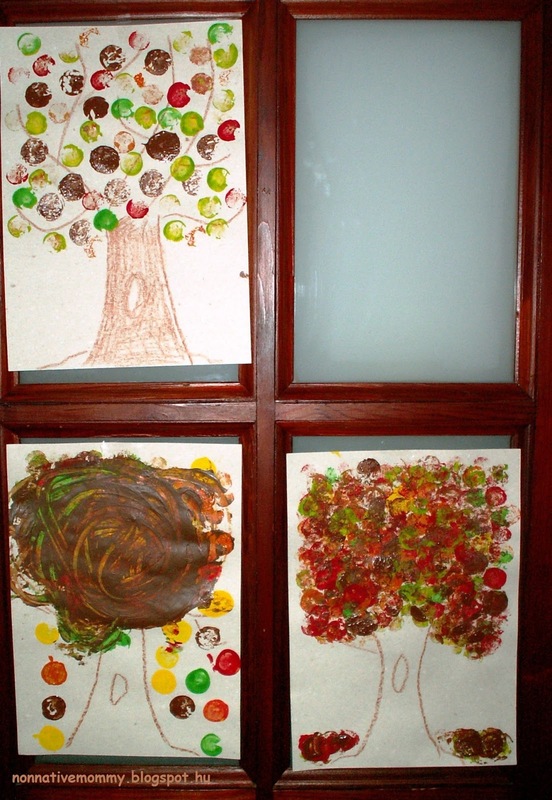 We did this projects in two goes as it was tiring and long-winding. E. was still enthusiastic, even at the second round. 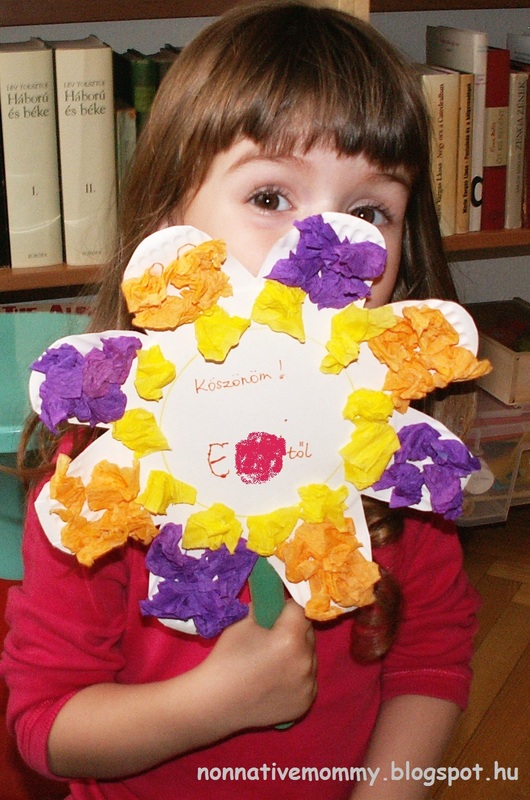 Unfortunately, I forgot to take a photo of all the three flowers so here is what we made for Ms K.
Needless to say, they were all over the moon when they received their presents. 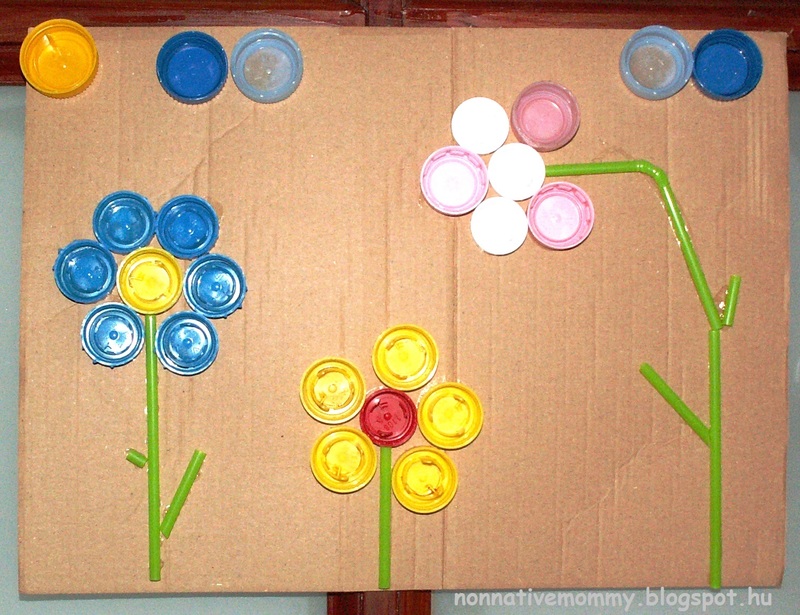 Have you done some flower crafts or projects lately? Do not hesitate to share it in the comments below. To be continued…. with a flower science experiment. Stay tuned!